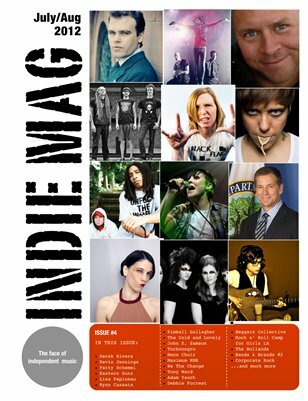 Indie Mag is a new magazine for independent musicians highlighting scenes, musicians, and music driven causes from around the world. Each issue is filled with interviews and features – from indie innovators to acclaimed songwriters, from producers to managers, from up-and-coming artists to label owners. It’s all about spotlighting the best independent musicians around the world and celebrating them. Indie Mag is also embarking on a mission to transform the magazine into a social enterprise that raises funds for the indie music community through its publication. Visit: www.indiegogo.com/indiemagproject for more details. In our July/Aug 2012 issue we talk to Derek Sivers (founder of CD Baby), Patty Schemel (Hole/The Cold and Lovely), Kevin Jennings (CEO of Be the Change), Lisa Papineau (Big Sir/Air) and many more.